Hack the City This Monday! 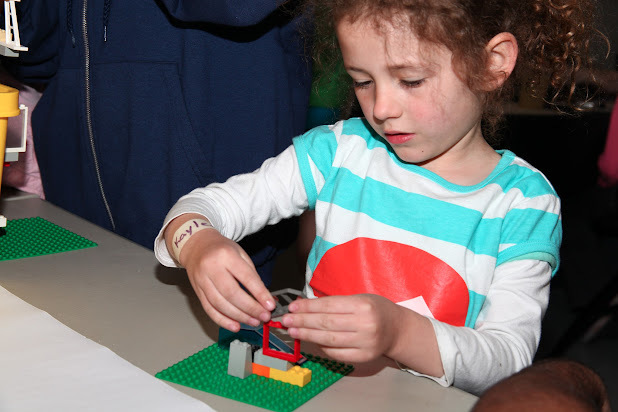 Monday, April 1st is where HacKidemia will kick-off their one-day 'Hack The City' event where all children are welcome to experience a new way of learning and get their hands dirty on the latest technology out there. Drones, 3D printing, laser cutting, video game programming, hacking the standard systems, that's what you can expect here. We did an in-depth interview with one of the founders, Stefania and talked about HacKidemia, the future of education and learning and why you should take your kids to HacKidemia! Welcome Stefania! Can you introduce yourself and tell us about HacKidemia? Hi betahaus! I'm Stefania, I'm one of the co-founders of HacKidemia. HacKidemia is a 'mobile inventions lab' for the future. 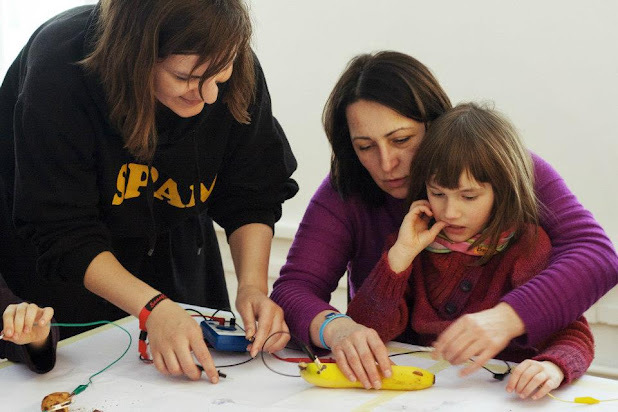 We sometimes also call it 'the education of the future lab' and the reason we call it that way, is because at HacKidemia we teach children in new ways and it's very interactive. We design the workshops for them, so it's really like learning by doing and learning by playing. So the way it works is that we have a team of mentors that are from all the countries in the world. We are right now in 8 countries, in 4 continents. The mentors are trained to work with children in a different way. The children are the ones who decide how fast they want to learn and what they want to focus on. We just provide a library of workshops. So you have to imagine a room, which is kind of like in Charlie and the Chocolate Factory with science, technology and art. It's very important to add the art element when we talk about science and technology, because that's what triggers children's creativity and imagination, which allows them to invent new things and get excited about them. How did you get involved in the whole project? My story is a bit long, but I'll keep it short! I actually come from Transylvania, Romania. When I grew up, my mother was a teacher and my father was an electronics engineer. So I grew up inventing, building and fixing everything and seeing my mother teaching to children and I kind of put those two together. I was lucky because a studied a European Master on Instructional Design, which means education with new technologies. That was in France, Spain and Portugal, which allowed me to study the educational system in these three countries and see how it's done, where it's broken and how it could be improved. It also allowed me what the common things and differences are in these three countries in terms of learning. Afterwards, I was hired by Google and I worked in search quality for a year. I learned everything about new technologies, web infrastructure and how information was organized on the web. After working for Google, I said, "This is all great, but there are so many people in the world that don't know anything about it". So I just wanted to go and not only share access to information, but also share access to knowledge. I think the first challenge for us was to get information, but now we're so overwhelmed with information that we need to start sharing and making knowledge from that information. Because there's this thing that we're drowning in information and starving for knowledge. So, how do we put all these pieces together and what do we make with it? I think a challenge for our society and generation is not to become couch potato's and consumers and customize what we want to use. How can I reverse engineer my phone, so I can make it what I want it to do? I also like to play video games, but how do I make the most awesome video game that exactly does what I want it to do? That's what we want to do with children. So It was kind of meant to be? Yeah, after I worked for Google I went to Cambodia, and worked with about 100 children for 4 months, so I setup a FabLab for them. That's what inspired me to create HacKidemia, because it was such a rewarding experience. I saw children of all ages were working together, because the younger ones couldn't speak English, so I couldn't talk to them. So I had to train the older ones that were teaching the younger ones and in turn they were teaching the younger ones. So we created these circles and I realized that there's no one that can explain to a child better than another child. That's something that should be encouraged by placing them in such circles of different ages so they can learn from each other. How long has HacKidemia been around? It's almost 6 months and in that time, we've trained 2500 children and mentors and did 45 workshops. What were some of HacKidemia's recent achievements? Most important achievement for me personally, was that when teams started organizing events independently. Because they were inspired what we done. So we created a guide for anyone who wants to setup a HacKidemia with the steps that they need to follow. It's all about freedom within a framework. Because we did that guide and put up all the resources online on our wiki, we had a team in Zagreb that created a HacKidemia there and we didn't train them or help them per se, but they proactively created a HacKidemia. For me that's the most rewarding and that happened in Zagreb, Timișoara in Romania, and it 's now happening in Slovakia and Athens. I think another thing that helped a lot is that when I did a HacKidemia in downtown Las Vegas. Some children came because they saw a video of children in Nigeria and Brazil doing it and they became super excited! I think the biggest achievement we've made is to allow children to understand that they're a part of something bigger and to collaborate with children from all around the world. What are some of the activities children are able to experience? On Monday, 1st of April, some of the workshops are on digital fabrication. So they will learn how to use a laser cutter - or a CNC router - and make mini libraries for the city from recycled carton boxes. So the theme for the whole event on monday is 'Hack The City'. So how can we use this 'Do-It-Yourself' and Fabrication to improve the city where we live and how do children imagine the city of the future. So we will have different parts, right. There's one on making furniture for the city, 3D printing, where they will learn how to use a 3D printer. Basically, how they can print new garbage cans where there is none. On transportation we have a workshop about drones. So they will learn how they can use an Arduino to control a drone. So you can control a drone through your browser and by synchronizing multiple drones, you can make them dance. They will also learn how to make music. Basically, a city is not cool if it's not happy. To make a city happy, you need music. And you can make music with anything. 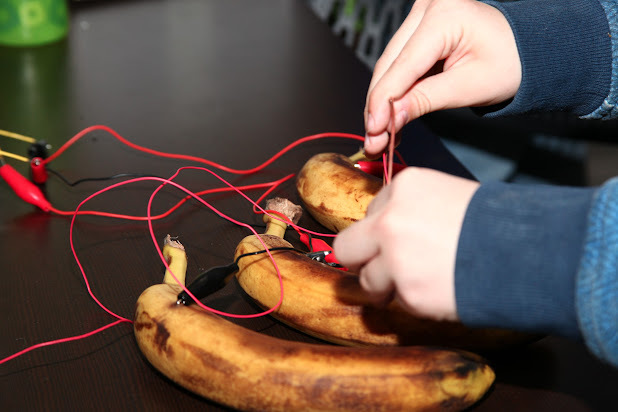 So we will use what is called 'Makey Makey', which allows us to connect everything that conducts electricity to the computer and use, for instance, a banana to make music. We will also learn them how to make Piezo microphones, which works with vibrations. When you put them on any surface, you can transform furniture into musical instruments for instance. Is the event a step-by-step process? Is there an hour-by-hour program? No, that's the magic of HacKidemia. Everything happens at once. So it's a huge chaos but at the same time it's very magical. Because it creates a dynamic where everything happens at once and everyone is doing something, which excites the children. I think it's important to not impose a schedule where they are forced to sit from this hour to that hour, because that's what happens at school, and we don't want to do that. We want to give them the freedom to try everything and let them choose what they like the most and they will sit there for 2 hours and not be able to send home. Well, that's what usually happens. We're also doing marble shoots. Where they will create these installations where they use play dough and marbles. There is a workshop about dreaming. Where they will do some kind of storytelling thing where they have to put on paper what they imagine how the city will be like and then combine them. We will do video game programming, where they will make video games about the city. Yeah, this is just a small selection of what will take place during that day. There's not schedule, so everything happen at once. There are some happening in the morning, some in the afternoon. We try to cover the whole city, so we have things happening in the South of Berlin and some North of Berlin and just connect all the makers in Berlin and involve everyone who have some influence in making. I'm especially trying to get children from Wedding and Neukoln to participate since they usually are never exposed to these things and I think it can be life changing. I believe that curiosity is the only thing you need to spark within a kid. How do children usually response to the learning process, the activities or HacKidemia in general? They get super excited! The beauty of working with children - I train adults as well, so that's why I compare - is that, they are natural curious. They want to learn everything and learn how things work. For them it's natural to make a trial-and-error experience and because they still have that, it's really magical because they discover things we don't see anymore. The way they experience it, they enjoy it together. They will explain it among each other, collaborate and are excited to present it to their parents. It gives a real sense of pride because they've made something real, something tangible. Why do you believe children should be more involved in the latest technology in contrast to conventional education? Because that's their future and they need to be part of it. I think the problem with us is that our future is always decided by people that come from the past and I want to empower them how to build the future. Do you think HacKidemia more or less represents the future of education? I think that would be very ambitious to say. When we talk about education - in regard of learning - it always makes us think of institutions, schools and super strict things. I think learning happens everywhere and we never stop learning, which is the beauty of it. It's why I am doing this, because I learn all the time. I think HacKidemia is an organization for community learning and a platform that will allow future solutions of learning to be born. It's the first step. I really think education happens when we can touch things and being actively and hands-on involved. There's currently a lot of online education right now, because it's easier and it's fast to make a video and send it to 10.000 people. But how will they learn and remember it? Learning is about people and being in close contact with people and we will never be able to replace that. I think the challenge right now is to find a balance between online, offline, hands-on and collaboration. Although it's harder to scale, develop and make it big, it doesn't really matter. As long the people involved learn, are having a good time and it's useful, that's what matters. I think for things that are valuable it takes time, it's completely normal to take time and it needs an organic growth.